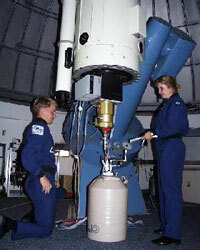 In 1978, a 61-cm Boller and Chivens Cassegrain telescope was donated to the Academy. This telescope was purchased by the Air Force in 1965 and used at the Cambridge Research Lab, Hanscom Air Force Base in Boston, Massachusetts until 1977. For more information about this telescope and the Air Force Academy program, visit the Air Force Academy official website.